"Friends' star Matthew Perry was unforgettable as Chandler Bing on the iconic sitcom... but for at least three years the actor can't remember anything about his role in the show. The revelation came during an interview with BBC Radio 2 when Perry admitted that thanks to an addiction to Vicodin and alcohol, he can't remember filming seasons 3 through 6. When asked to name his favorite episode, the 46 year old star said, "I don't remember three years of it... I was a little out of it." Perry entered rehab during season 7 of the show; his stunning weight loss became alarming both to viewers and fellow cast mates. The actor is currently in London rehearsing for his upcoming play "The End of Longing" and was unable to attend a 'Friends' reunion, of sorts; the other five cast members sat together at the taping of the upcoming NBC special honoring acclaimed sitcom director James Burrows. The moment was captured in a photo with the cast of 'The Big Bang Theory'. Star Kayley Cuoco posting the pic with the caption: "Ummmm NIGHT MADE," Cuoco captioned the photo. 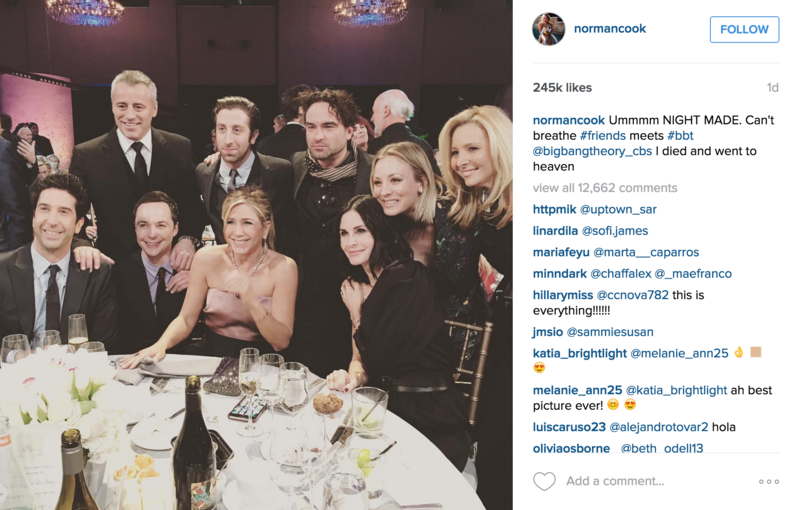 "Can't breathe #friends meets #bbt @bigbangtheory_cbs I died and went to heaven."